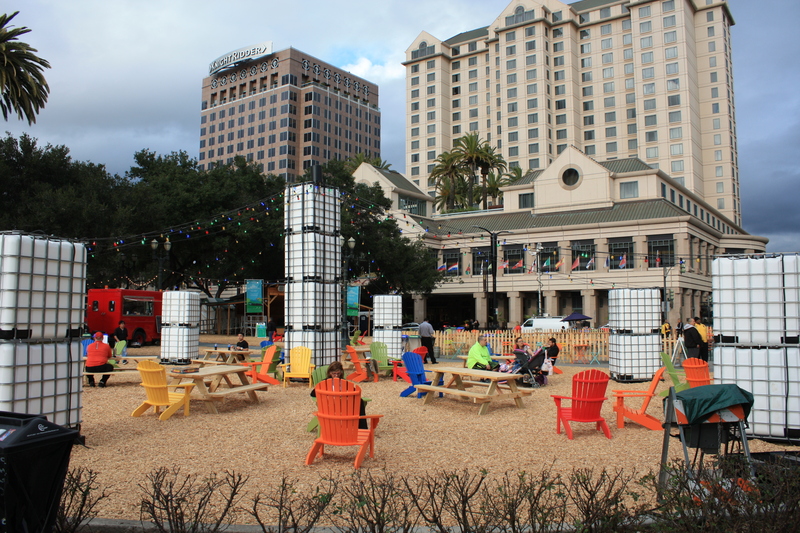 Thanks from funding from the Knight Foundation and Adobe, the City of San Jose Parks, Recreation, and Neighborhood Services has brought in Groundswell Design to create Winter in Plaza de Cesar Chavez. A free public activation creating a warm and welcoming park where locals and visitors alike enjoy sitting by a fire, tossing beans bags, playing on the football field or enjoying food from a Jose food truck while listening to a local DJ, or live band. The park is open from Noon to 10pm everyday through Super Bowl Sunday February 7th. As this site has suggested previously, it’s great to see this park known mostly for hosting Christmas in the Park, being transformed into a vibrant public hub in downtown. The idea behind this project, is to create a place people want to be in, and use Super Bowl week as a launch to prototype the park for future activations. Check out the opening day pictures below.